This week’s snowy weather brought back some memories of the last winter blast we had in 2008. 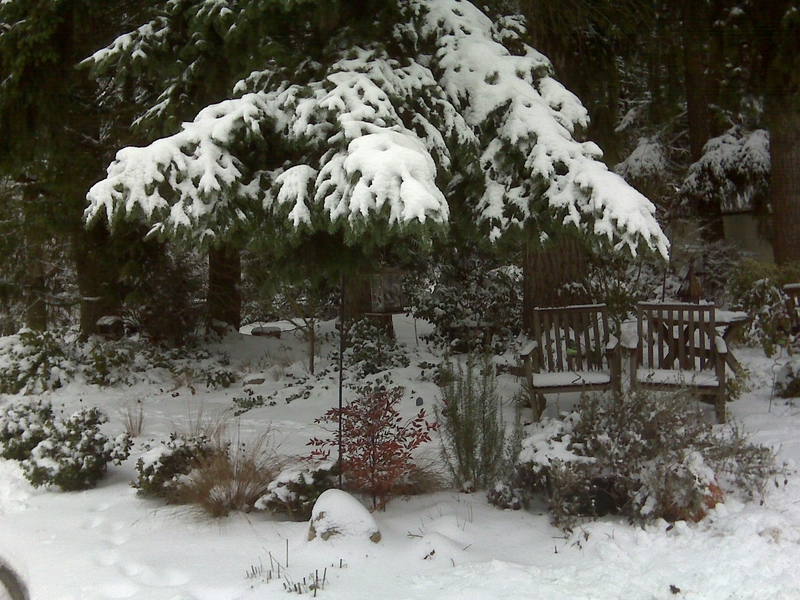 The northwest was hit with the most snow in a decade, with about 8 inches accumulating starting December 20. My parents were visiting from Arizona that year – as was their pattern, they spent Christmas with a different child each year. It was Jan’s year, but since we are so close, they usually spent a few days before the holiday with the one who wasn’t their Christmas kid. They were scheduled to head south on December 23rd. We were having a great time together. I did my holiday cookie baking and they enjoyed being with the kids, all of them home from school for the break. Once the snow fell, we had a day to enjoy it, but the forecast was for continuing sub-freezing weather. This raised the question: How would mom and dad get to Portland? They planned to drive the rental car down, but even the freeways were icy. Dad was a planner and didn’t like leaving things to the last minute. Watching the weather forecasts became his focus and I started to check alternate transportation for them. I called the airlines, Amtrak, buses, and private car services all with the same response: We can’t guarantee what our plans will be on the 23rd. We talked with Jan and I suggested that if the ice and cold made driving too risky, they could stay with us for the holiday and then spend Christmas with Jan next year. Dad would have none of it. I think in the back of his mind, he knew that Jan was battling cancer and might not have another Christmas. He was determined to get there – resolved in a way I’d rarely seen him. As the 23rd approached and no options became available, he said he was driving down. We wanted him to at least have chains for the car, so we went out in search for them. All were sold out. A neighbor gave us a set that they had, knowing they wouldn’t get them back. The morning of their departure, Jan called one more time to try to talk them out of it. She explained that even if they made it down I-5, their neighborhood had been hit with freezing rain and getting to their house was dicey. She was really worried about them. Dad insisted, and at about 11 a.m. he was ready to go. I insisted on packing food for them, along with some other things that might be needed in an emergency, like blankets, water, a list of numbers they could call for help along the way, and a promise to keep their cell phone on so we could call and check on them. As they left our neighborhood, they followed Seth! in our Expedition out to I-405. Once there, they were on their way. I called Jan to let her know what time they left. She again expressed her absolute amazement at the risk they were taking and the risk they were putting others in that may have to go rescue them. I said to Jan, “Dad’s on a mission. He has to be with you this Christmas. There is no way you or I could talk him out of that. They are adults and get to make their own decisions, and we have to let them. It’s scary, but I believe they will be fine.” She accepted that, but still wasn’t able to relax until they arrived. And arrive they did – at about 4:30 in the afternoon, Jan got a call saying they were in Lake Oswego. The plan was for them to park the car somewhere in town and George would pick them up in their Subaru to shuttle them to the house. It all worked out in the end. Dad was the guy in charge, and he made it happen. When I talked to him that evening by phone, I told him I was proud of his accomplishment and I understood his urge to be there. A parent will move mountains to be with their child, even more so when that child is ill. Jan was thinking rationally, but dad was following a much more personal path. He was following his heart. This entry was posted in Family, General Rambling. Bookmark the permalink. I love this story about your Dad’s determination. I understand it completely. Bravo to Dad!